Vivenso Cleaning System is the most advanced in the market because of its ability to use water as the sole filter and its self-cleaning separator. There are several other water filtration cleaning systems on the market which may require additional filters or are not even designed with separator technology; Vivenso is the only filtration system worldwide with a self-cleaning separator. 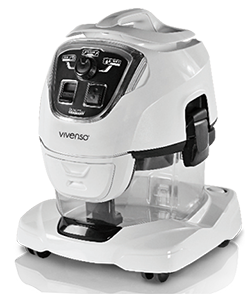 Not only was the water vacuum, vivenso Best Product of the year 2013, it also received a Plus X Award in three categories - Innovation, High Quality and Functionality.